The myriad ways Beijing residents understand and nurture the good life, drawing on cultural resources ranging from ancient metaphysics to modern media. 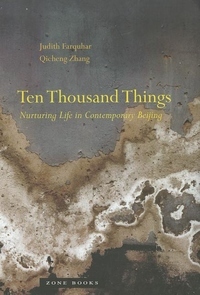 Ten Thousand Things explores the many forms of life, or, in ancient Chinese parlance "the ten thousand things" that life is and is becoming, in contemporary Beijing and beyond. Coauthored by an American anthropologist and a Chinese philosopher, the book examines the myriad ways contemporary residents of Beijing understand and nurture the good life, practice the embodied arts of everyday well-being, and in doing so draw on cultural resources ranging from ancient metaphysics to modern media. Farquhar and Zhang show that there are many activities that nurture life: practicing meditative martial arts among friends in a public park; jogging, swimming, and walking backward; dancing, singing, and keeping pet birds; connoisseurship of tea, wine, and food; and spiritual disciplines ranging from meditation to learning a foreign language. As ancient life-nurturing texts teach, the cultural practices that produce particular forms of life are generative in ten thousand ways: they "give birth to life and transform the transformations." This book attends to the patterns of city life, listens to homely advice on how to live, and interprets the great tradition of medicine and metaphysics. In the process, a manifold culture of the urban Chinese everyday emerges. The lives nurtured, gathered, and witnessed here are global and local, embodied and discursive, ecological and cosmic, civic and individual. The elements of any particular life--as long as it lasts, and with some skill and determination--can be gathered, centered, and harmonized with the way things spontaneously go. The result, everyone says, is pleasure.